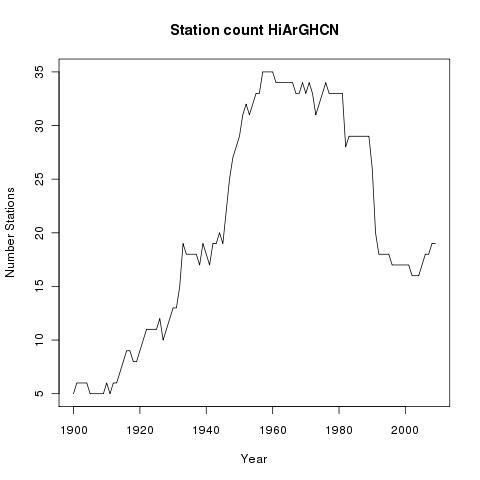 This post complements Ron Broberg's nifty movie of the progress of GHCN stations over the years, and in particular, his decadal stills. 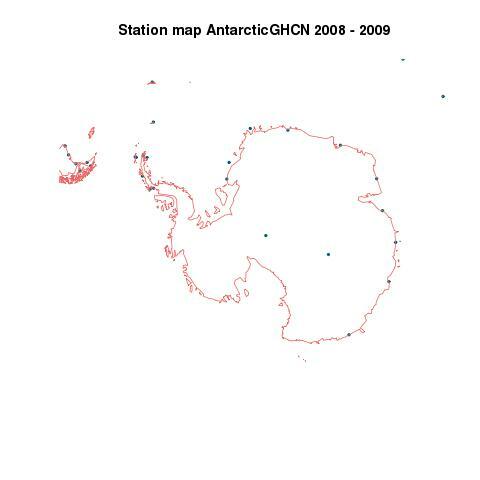 I've made KML files for the decade years (1880, 1890,...) of all stations that have records (at least one) in those years, for visualisation in Google Earth. 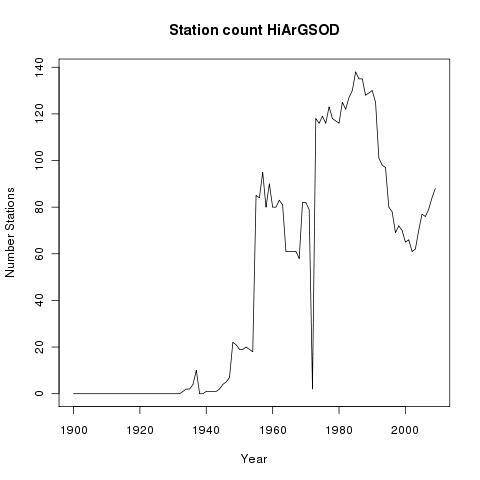 You can read them into GE and see in detail how the network of stations varied over time. These files also have the description balloons etc. They are in a zip file called KMLGHCNyears.zip on the doc repository. Each is a kmz file. Just click on the file name in a file browser or use "open" in GE. If it's hot in Washington, how about Montreal? 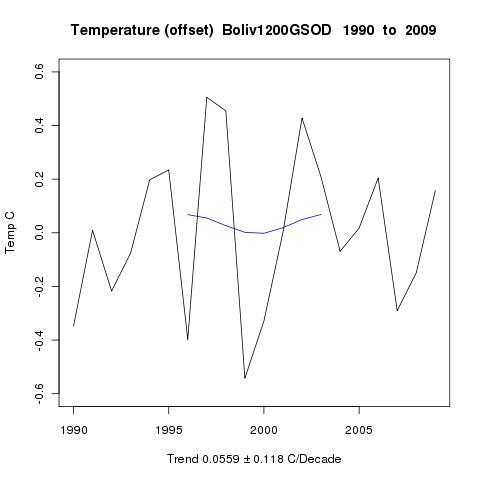 In one of Steve Goddard's posts at WUWT, there was some mocking of interpolation in GISS. 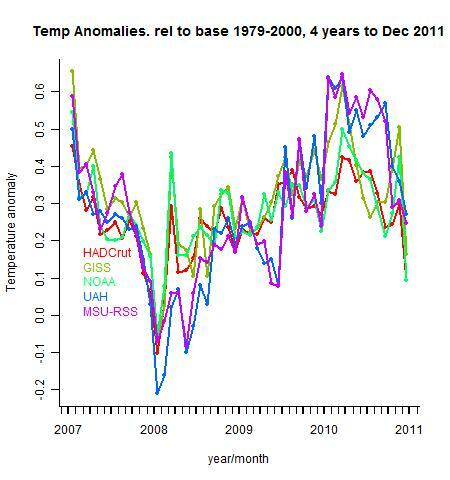 "Is the temperature data in Montreal valid for applying to Washington DC.? " was asked. 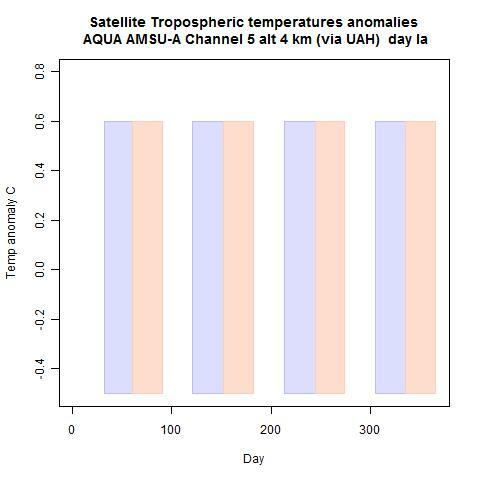 Anomalies are relative to each station mean over the period. 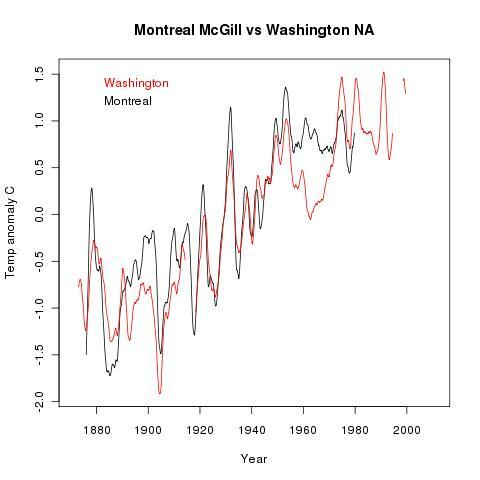 Notice the slip at about 1915, where Montreal seems to go up about half a degree relative to Washington. It could well be a station move or change. This is just the sort of thing GISS type algorithms can pick up, even so far apart. But this is unadjusted data. You can also see this data by drilling down on a LH panel (long list). I've also moved to using KMZ files, as is recommended. These are just zip files, each containing the appropriate KML file. GE will read them directly. The docs repository file is still called KMLfiles.zip, and now includes the R code I used and a Readme.txt file. So you can see how well the rurals are spread, and, if you like, zoom in to see whether you think the classification is right. 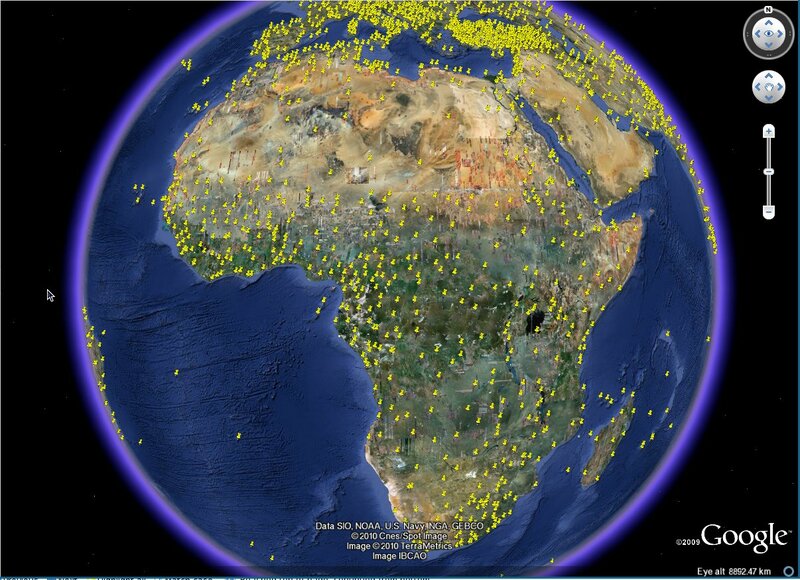 Steven Mosher has been a big advocate of using KML files to pass location data for stations into Google Earth. I'm planning to add KML file output to TempLS. 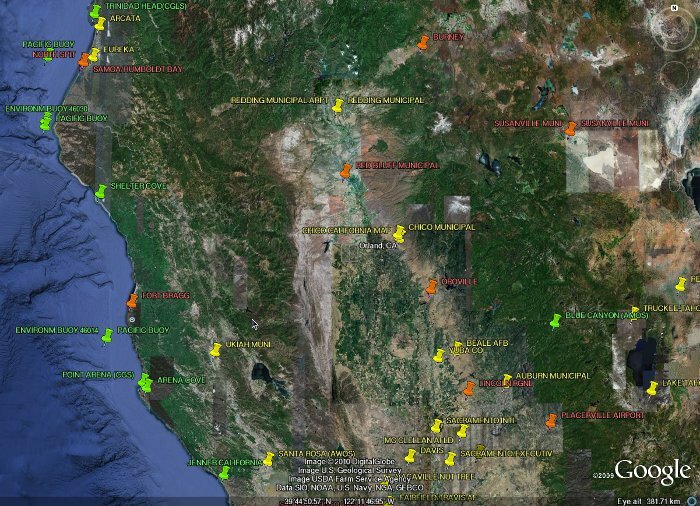 But in the meantime, as a follow-up to the previous post, I've made KML files for the GHCN and GSOD databases, if you want to look more closely at them in Google Earth. The files are on the docs repository. They are in a zipfile called KMLfiles.zip, and are called GHCN.kml and GSOD.kml. You can read them into Google Earth either by just clicking on the filename in a file browser (GE pops up), or by using Open or Ctrl-O in GE. These files just read in the stations as a whole lot of placemarks and names- there's no tour provided. 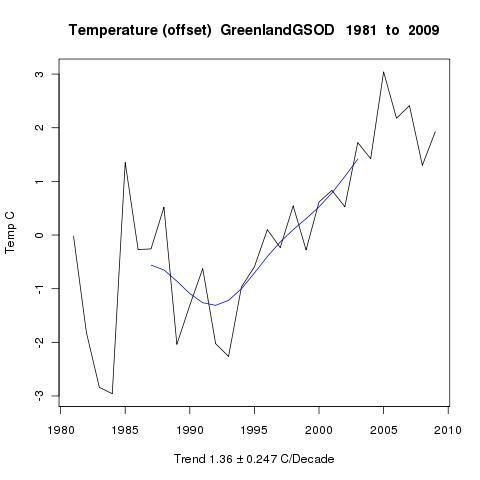 The Greenland study with the NOAA GSOD surface temperature dataset looked very promising. 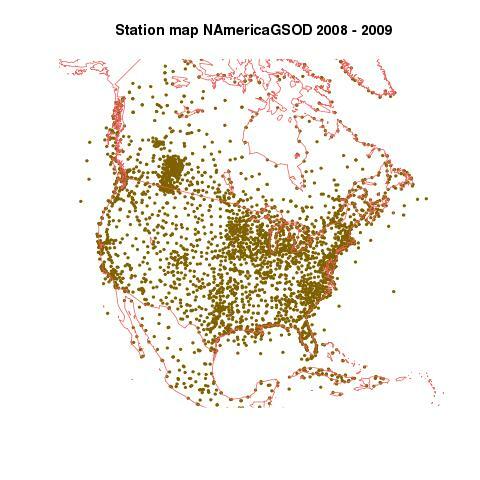 There are many more GSOD stations than GHCN, especially in modern times. But it turned out that they weren't very well distributed, being mainly along the west coast. 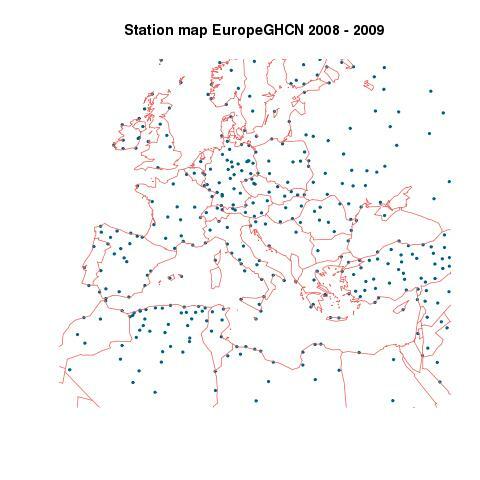 In that way GHCN did better, and its fewer stations may have performed at least as well as GSOD. So I tried to compare more closely for other parts of the world. It's a big and complex picture, but this may be a start. 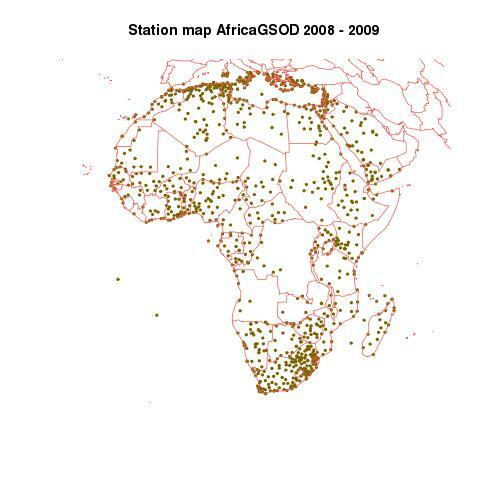 The coverage of both GHCN and GSOD has varied a lot over the years. 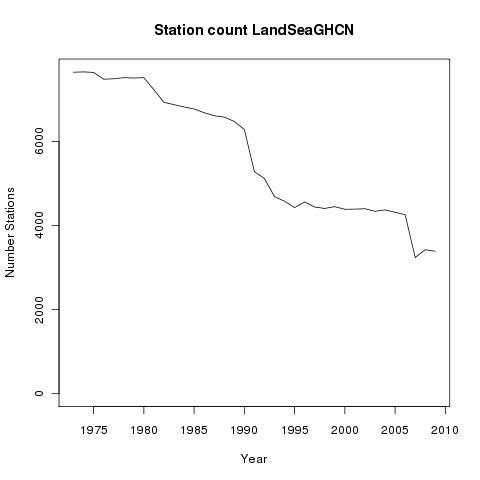 GHCN had many more stations in the decades before 1992; GSOD has not declined in numbers recently, but numbers varied between 1940 and 1972, and there is very little before 1940. 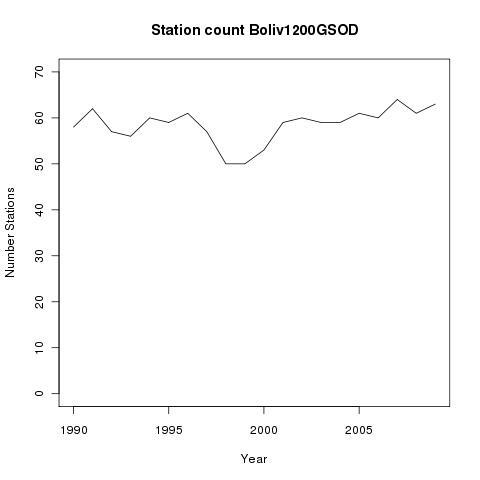 I decided to focus on the big contrast in numbers of stations recently reporting, where recent means since start 2008. Here are the side by side plots. I tried superimposing, but there is too much overlap. I tried combining images using color addition, but found it too hard to get the pixels aligned, so the result was blurry. Side-by-side worked out best. 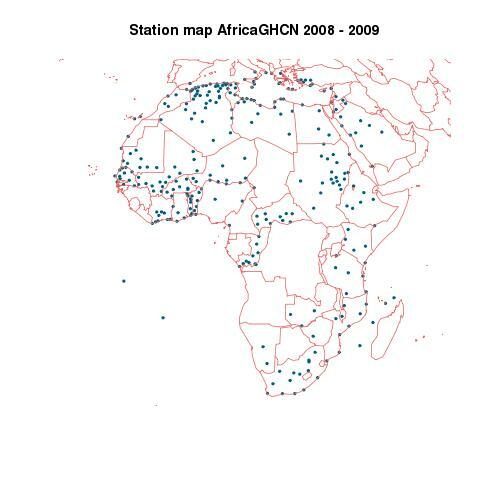 Many people have noted the Africa gaps in GHCN. GSOD fills some but not all - esp Zaire. 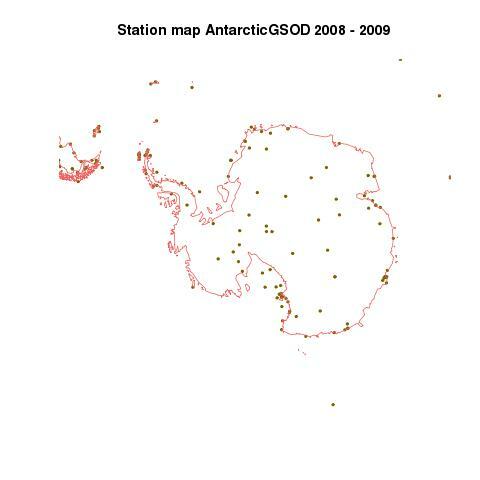 GSOD certainly has more Antarctic data. It will be interesting to see if it has stations that GISS does not cover. 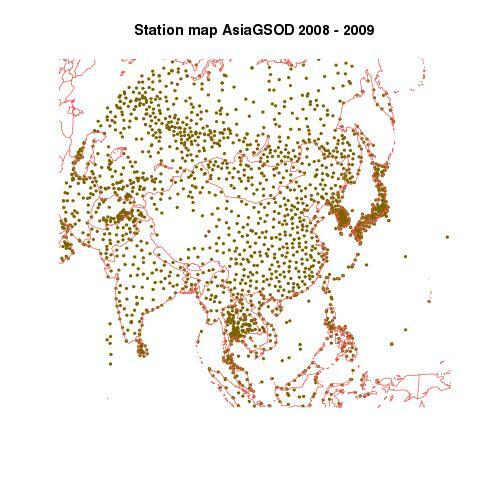 GSOD has much denser coverage of both China and India, although GHCN may well be adequate. Tibet is a gap in both. 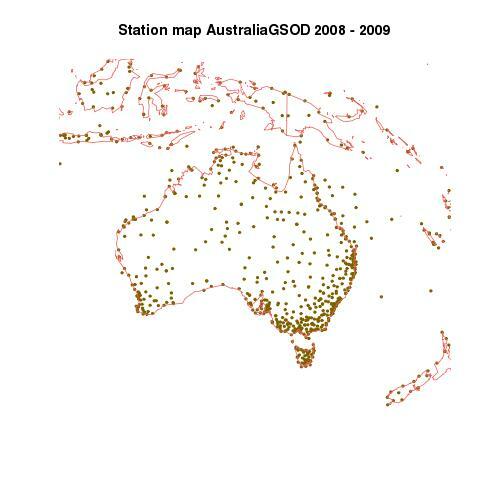 GSOD does better in the Eastern arid regions, but the Western desert is still sparse. 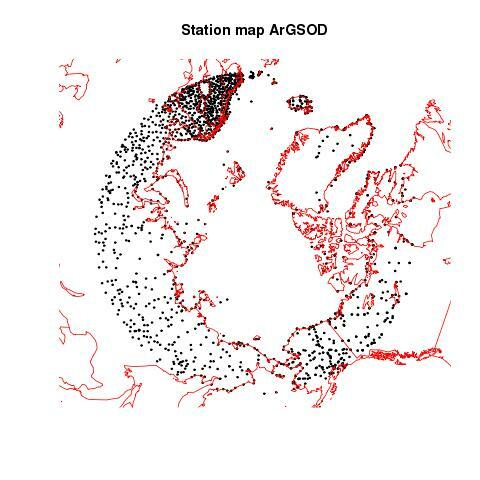 GSOD fills some gaps, and there's overkill as well.N Scandinavia is shown on the Arctic map. GSOD is generally better. Curious concentrations in Alberta/Sask and in Cuba. Well, we have Bolivia covered. 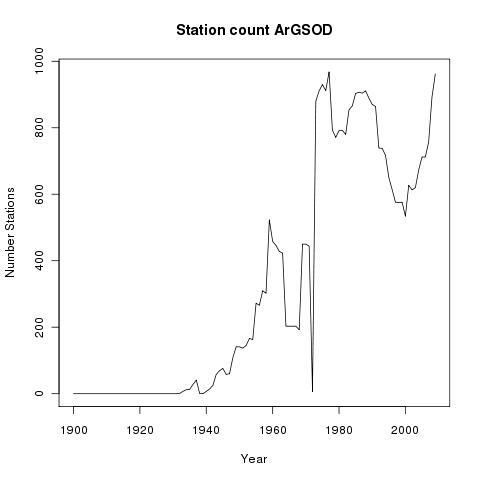 GSOD is still a bit sparse in the Amazon. 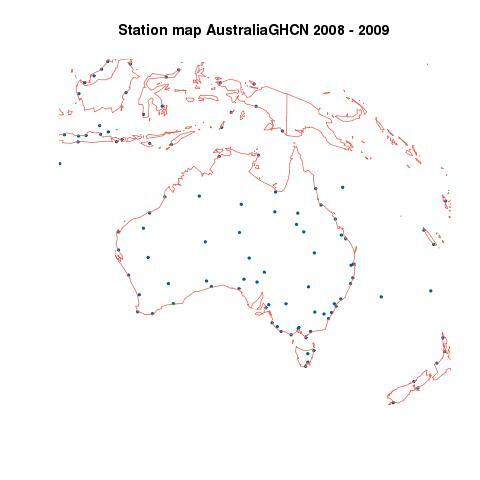 A general observation is that GHCN does seem to have a well chosen distribution. One would generally think that the tendency of GSOD to cluster should do no harm, but in fact it does put more pressure on the weighting system to make sure that the very dense regions don't disproportionately affect the result. Gridding limits the damage that could be done. 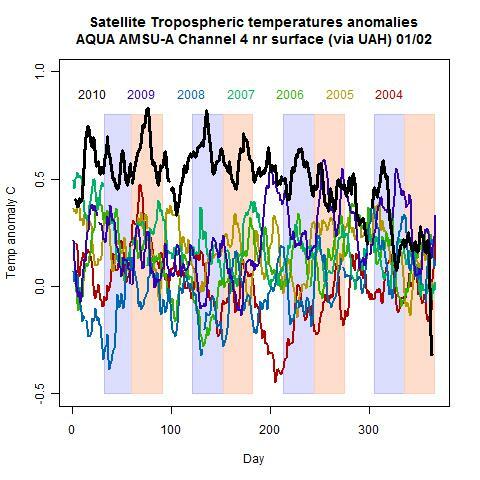 Do not trust any of the other channels for temperature trend monitoring. So that seems to say that Ch 5 below is OK, but not Ch 4. And now the monthly indices, shown for the last year, and the last four years. They will normally be updated on the same day as the above plots. Finally, a tracking plot to follow whether 2010 will be a record for any of the indices. 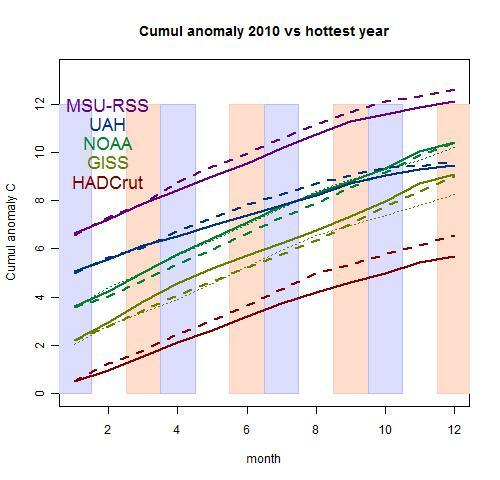 Cumulative anomaly just means the cumulative sum of monthly anomalies for 2010. 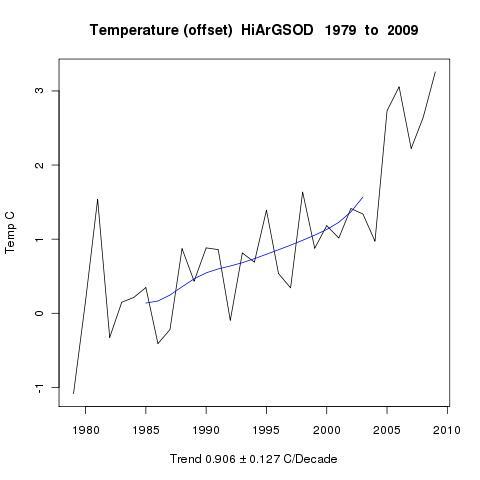 The comparison is to 2005 for GISS and NOAA, and 1998 for the other indices. 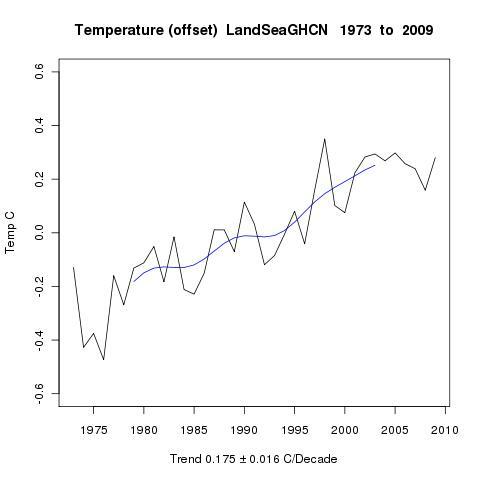 For GISS and NOAA, 1998 is lightly dotted. Since the absolute value doesn't matter in the comparison, I've started at an arbitrary level, spaced for clarity. Months are shown with vertical stripes. Details here. 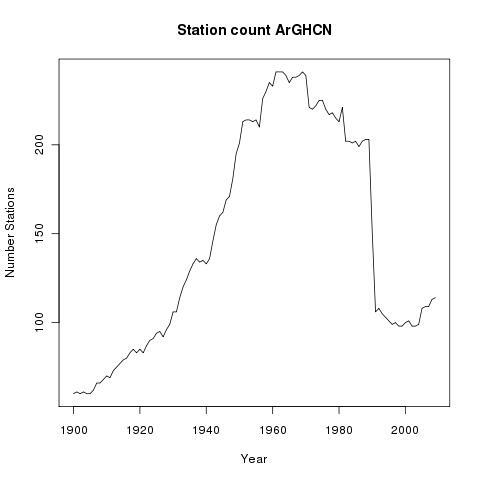 This continues the series comparing the GHCN station temperature data used by most major indices and blog reconstructions with the larger, different SYNOP-based NCDC GSOD dataset which Ron Broberg has made available. Since GSOD is patchy pre 1973, that is the start year for this check. 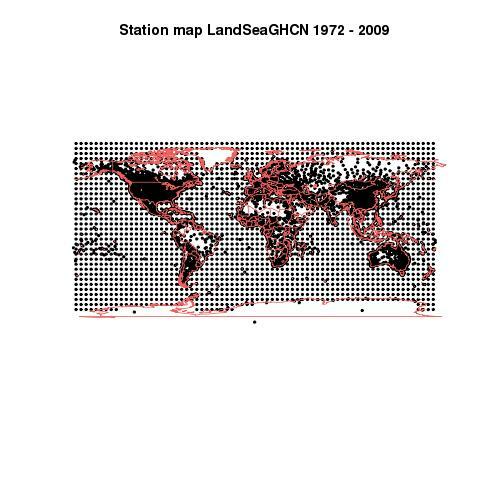 It turns out (below) that for Global Land/Ocean, both datasets give very similar results. 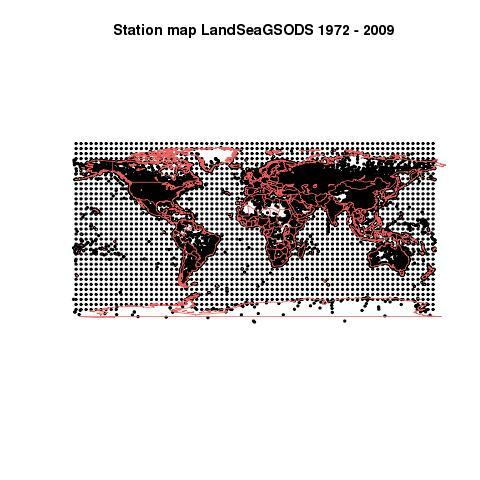 In a way, this is not surprising, because both use the same ocean dataset HADSST2, which covers most of the globe. 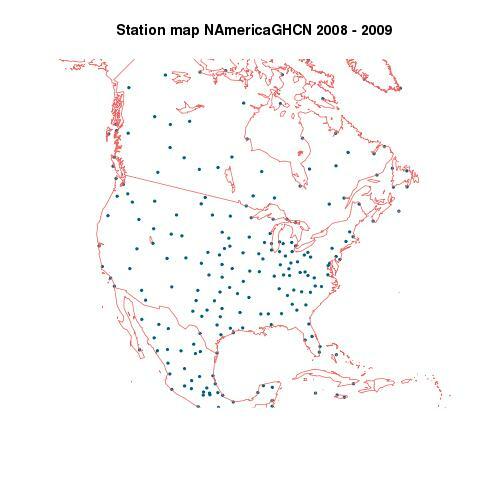 But it does suggest that any lack of coverage by GHCN is not a big source of error. And here are the plots separately, and superimposed. 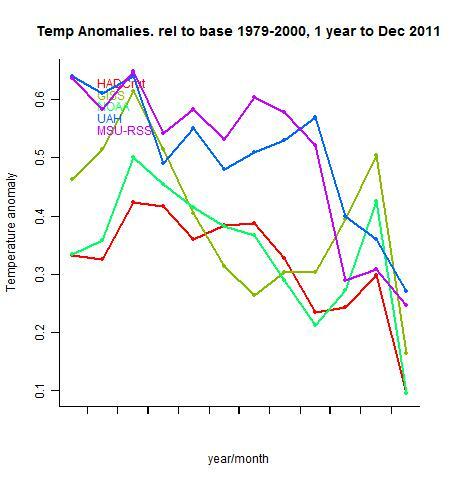 The anomalies are mapped to the common base period 1979-2000. Since we have already shown that the GHCN results compare well with the major indices, the GSOD results will also be very similar. 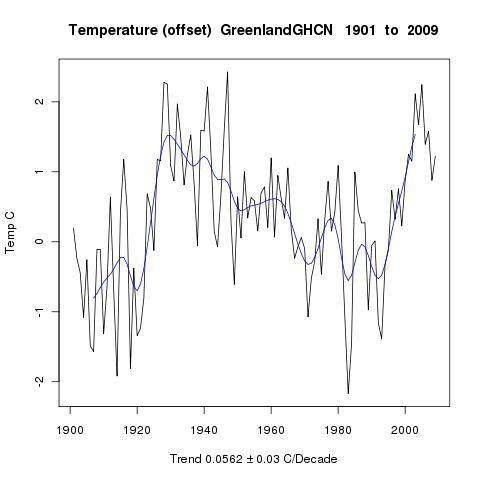 Greenland's temperature history has been discussed recently at WUWT. 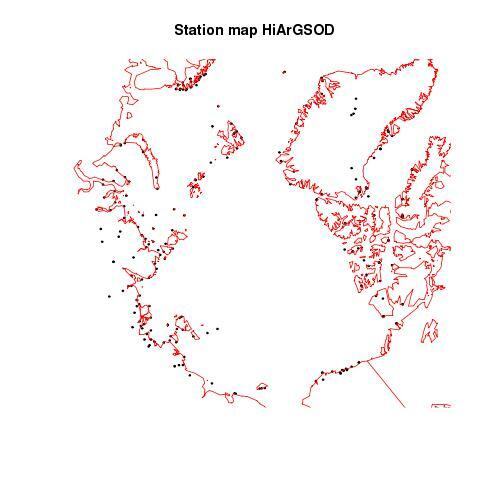 It is another region which is sparsely covered by measurements in GHCN, but has better numbers in the recent NCDC GSOD data which Ron Broberg has made available. 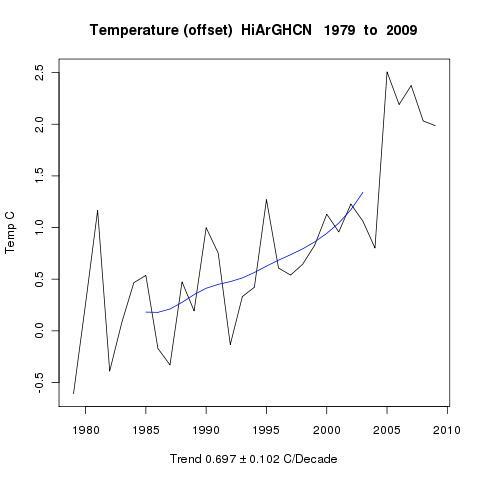 At WUWT Steve Goddard was criticising NASA for observing that temperatures had risen rapidly in the last 30 years. He didn't actually say whether this was right or wrong - he just said that nett movement since 1920 had been negative. 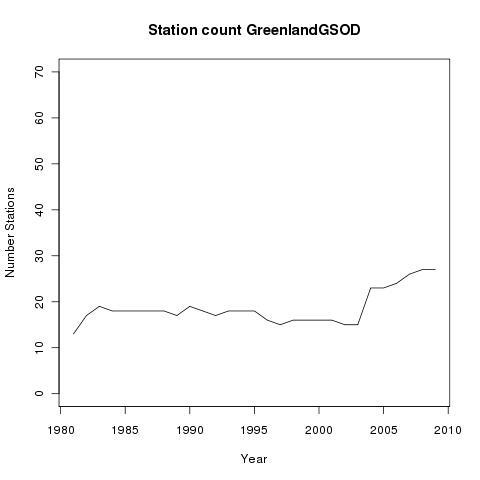 So with GSOD data for the more recent coverage, let's see. 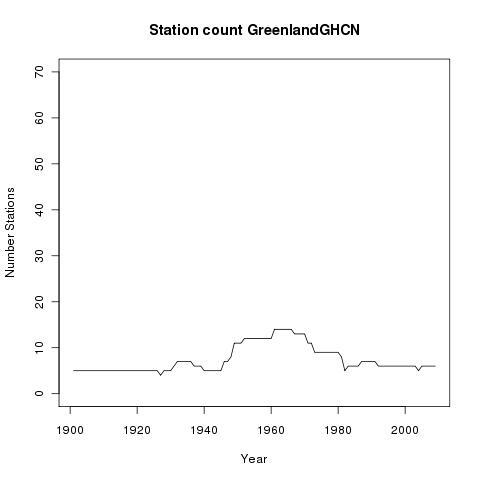 Here is the GHCN record for Greenland from 1901. It's true that it shows a marked warm period in the 1920's, and probably if you start a trend there to present, it would be negative. 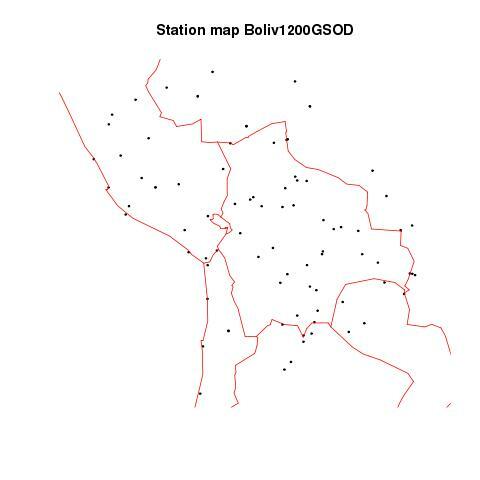 On the other hand, coverage is poor - mostly 5 stations up to about 1940. And we're about back to that now. Looking at the time period NASA was actually talking about, from 1981, then yes, there is a period of rapid rise from about 1990 to 2005, with some decline since, and ups and downs in the 80's. 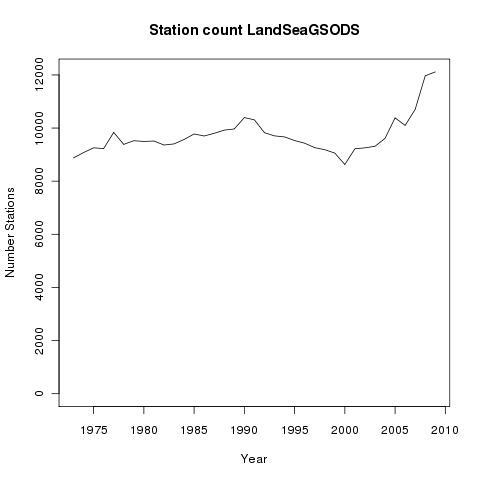 Although GSOD has more stations, they are mostly W coast. GHCN seems to have a better distribution. 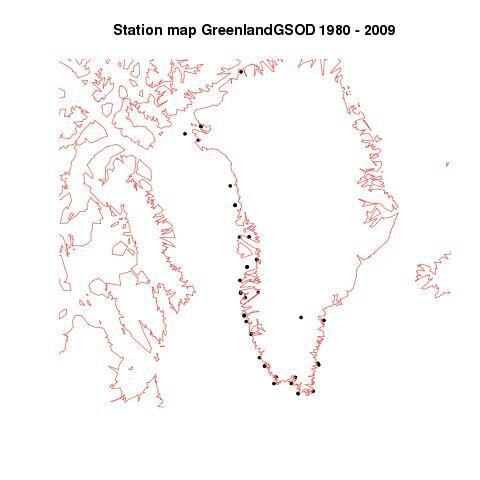 In fact, GSOD counts as Greenland Jan Mayen and an island near Svalbard; I took them out for consistency. 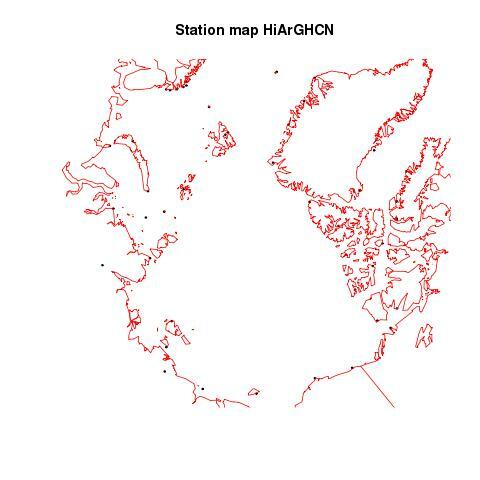 It's likely that NASA's plot uses satellite data, which is probably necessary since stations are restricted to the coast. 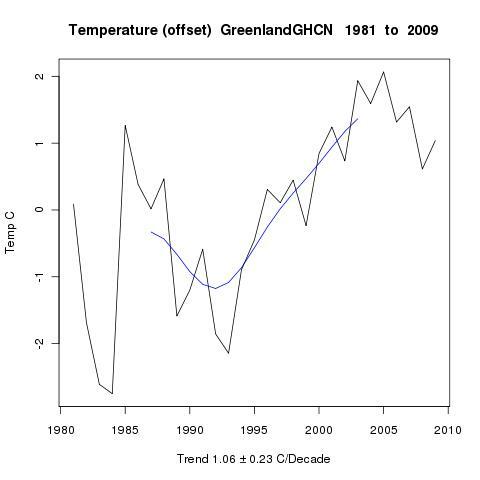 Certainly it's hard to see a rise of several degrees per decade on land from the instrumental record over thirty years, although the peak rate would reach that. 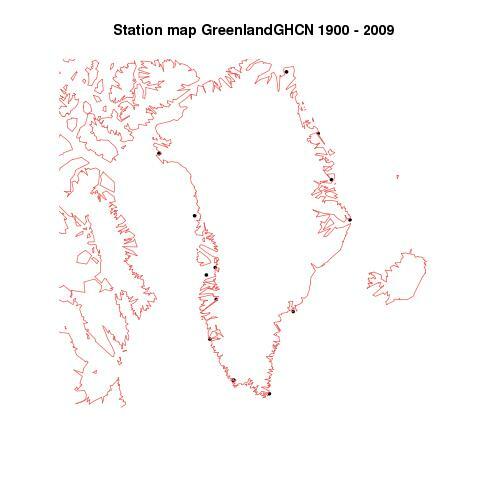 But in fact NASA's color scheme seems to show about 1C/decade on land. 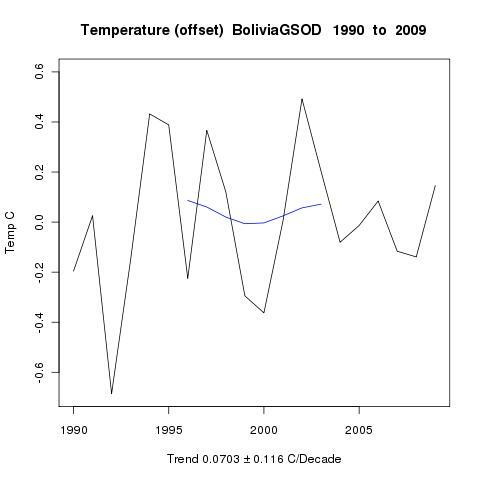 Back in April I looked at the "Bolivia effect". 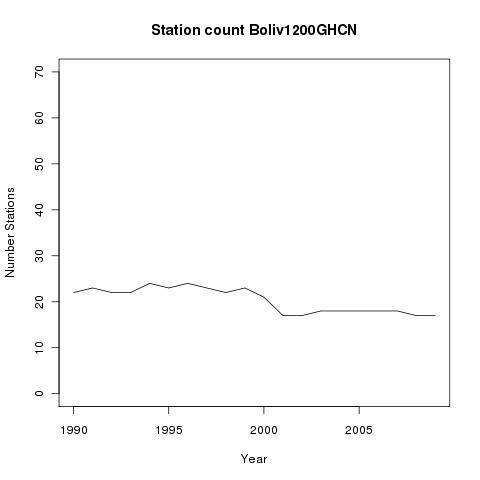 This was attributed to the absence of GHCN data from Bolivia since 1990. 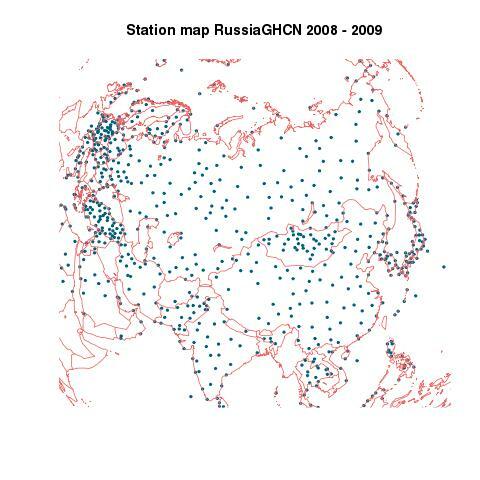 This does create a gap in the temperature data; there are stations just over the border. The conclusion was that there was no real evidence of a major problem, but perhaps some uncertainty remained. 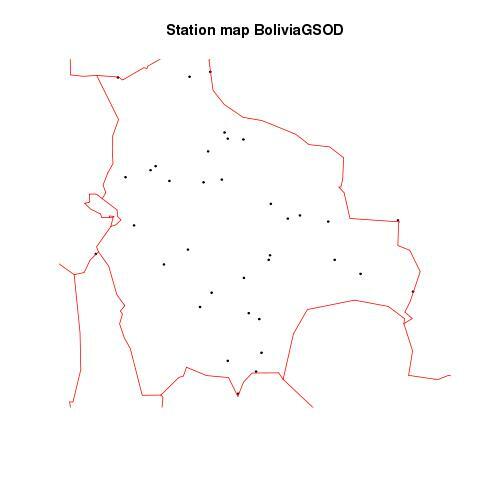 Now with GSOD data, which is available for Bolivia through to present, we can look again. I'll do a side-by side GSOD-GHCN presentation. 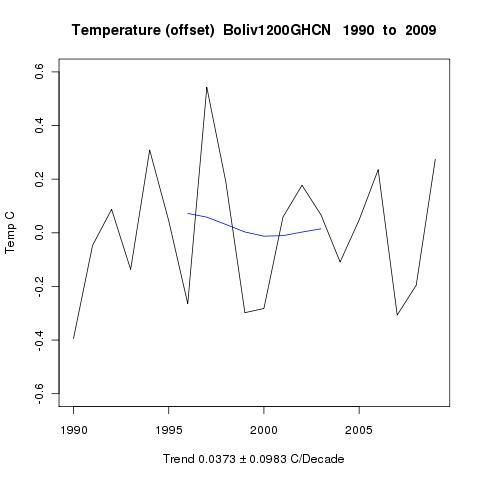 First is the anomaly plot and trend for a region within 1200 km of La Paz, since 1990. 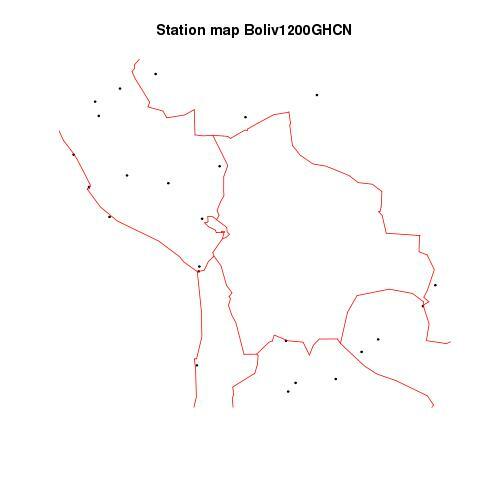 This can be calculated for both sets, even though GHCN has no data within the country. Both plot and trend are similar. 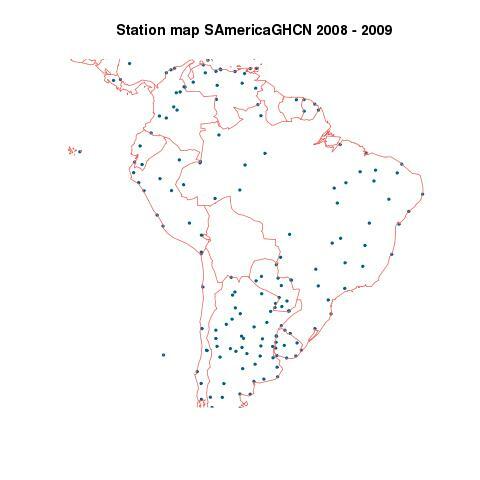 GHCN does a good job with the region, even lacking data within the country. 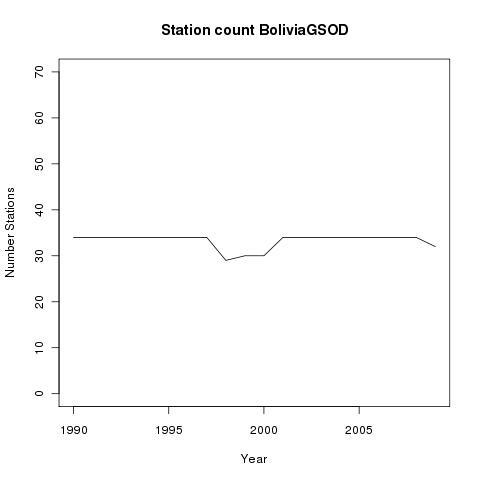 Next is a plot of GSOD data from Bolivia data. 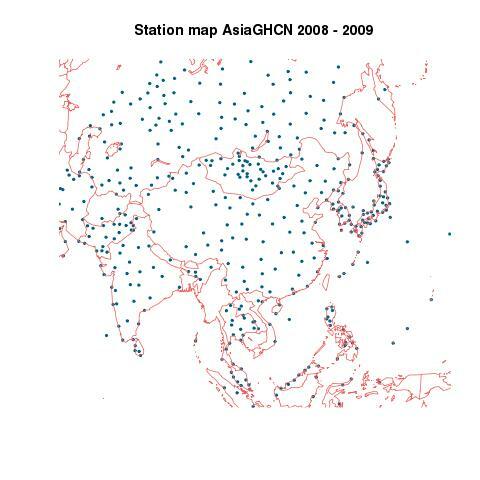 There are no corresponding GHCN results, but it is quite similar to the GHCN result for the 1200 km circle. 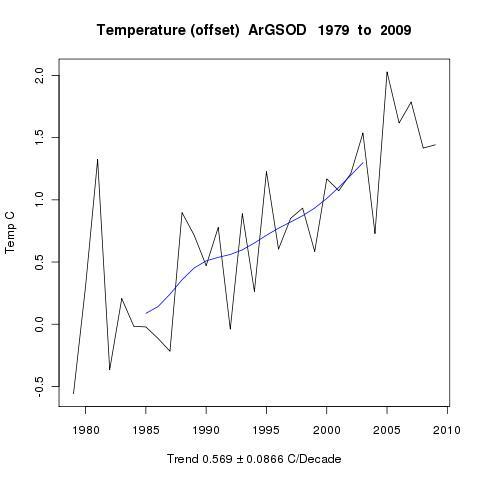 The previous post described the GSOD land temperature data from NCDC. This is a large set based on SYNOP data, which is plentiful from about 1973 onwards. Ron Broberg has processed it and put it into a useful format. 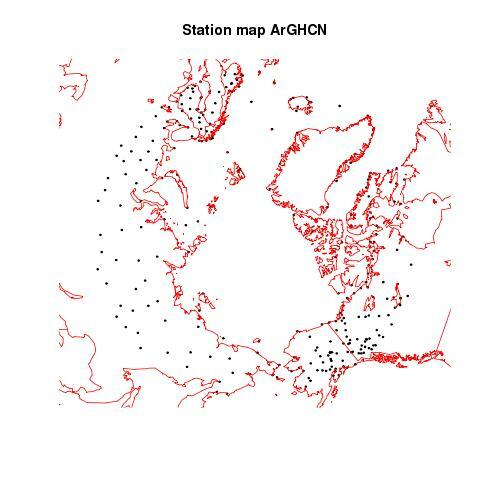 In particular it has a lot more Arctic stations than does the GHCN set. So my first regional application with TempLS will be to Arctic trends. Here are the side-by-side plots. 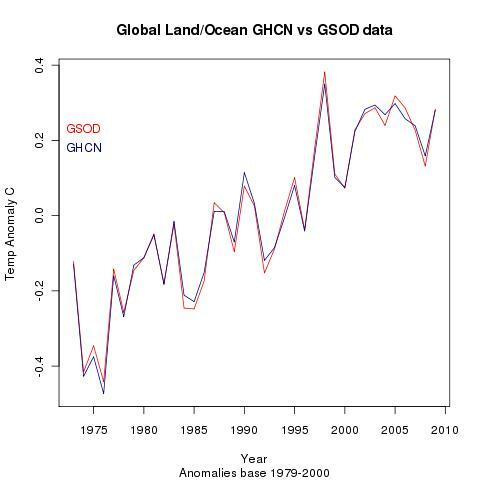 The scales do not necessarily match, and the temperature offsets are not the same for GHCN and GSOD. 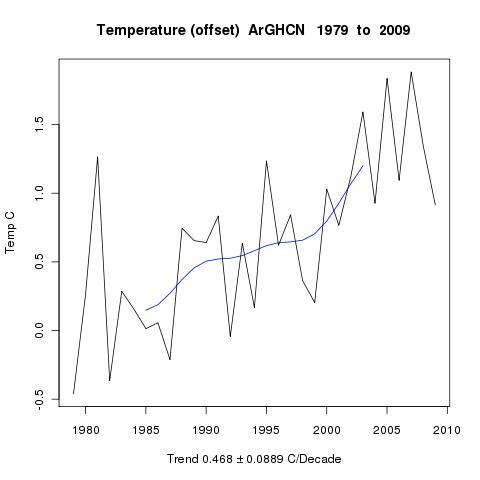 Both datasets show strong warming since 1979, especially in the High Arctic. 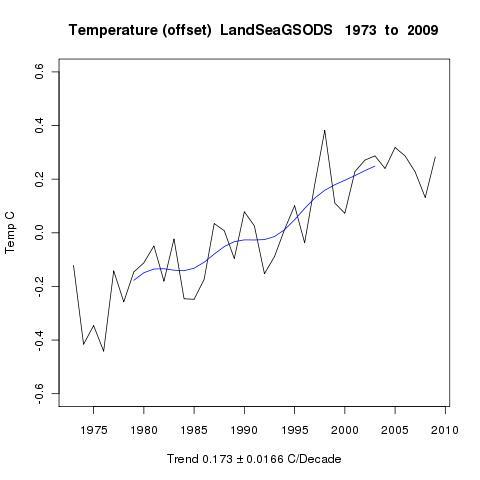 The more numerous GSOD data shows a greater trend (0.9 °C/Decade).